In this article, I’ll talk about situations where the pin is on the side of the green and the wind is blowing away from the flag. A safe play here can be to thumb the ball out to the side and let the wind take the ball back towards the center of the green, but you’ll often find yourself with a long putt and reduce your chance at birdie. Often times the better play is to cut the ball into the flag, but you must do so with caution. As mentioned, the safe play could be clubbing down to an 8-iron and thumbing the ball out to the right with bite. Another play could be the 7-iron with backspin thumbed out to the right. You’ll probably stick the green, but your putt could be longer than you like. Then again, the wind could catch it and pull the ball in the sand. Or, you could overdo it and hang it out right too long, finding water. This example provides an opportunity to practice a 7-iron B1-type shot with backspin. You still want the ball to end up at center, but you want to start it out to the left so it cuts back right into the wind, centering the ball. So how do you know the right angles here to make it work? First, you can review this article on B1 and B3 shots with different clubs. The biggest takeaway here is that low-lofted irons will cut across center, while higher lofted clubs won’t quite make it back to center. The 7-iron seems to come back right about center in both cases, with no wind. That means that if we played a B1 here, it wouldn’t come back to center because of the left-blowing wind. The least-costly mistake would be playing that shot, which would end up on the left side of the green (likely about the same place as a thumb shot out right a bit). The most costly shot, and what I see newer players do, is to pull back too far left of center. The shot might look pretty good at first, but you need to consider what’s going to happen AFTER the ball lands. With backspin, it’s still going to come to the right quite a ways, and here’s where a seemingly good shot might backspin off the right side of the green into the water. The correct play here is to pull back just slightly left of center and shoot most of the way out to 1 with backspin. This gets the cut you need to counteract the wind, puts the ball on the back middle of the green just left of center, and the backspin pulls it the rest of the way right to center. You’ll be punished by a miss here more often with the lower-lofted irons, which tend to cut more than you expect (especially while you are still fairly new to the game). If you had this same shot with a 5-iron, for instance, the better play would be the straight back to B and out to 1 shot. A 5-iron cuts back into the wind more forcefully, and in this setup, that shot should put you right on center. Safe is good, and finding the middle of the green keeps you out of trouble. But as you hone your skills, keep practicing these B1 and B3-type shots, keeping the loft of the iron in mind to help you know how much cut to apply. And if you’re using backspin, err to the middle of the green! Most of us have a decent handle on distance when shooting a straight B2 shot. However, what happens to your distance when you try to shoot the same 180-degree shot at an angle? More than likely, you’re going to lose distance. Theoretically, you should get the same distance off these shots as straight B2 shots, but there are a couple factors that may be limiting your distance. So let’s say you’re hitting a 7-iron into a 14 wind blowing right to left. Turning right may not be an option because of other factors, so your best chance is to pull back to A and hit forward to 3. Yet, you see your shot come up much shorter than expected. What happened? 1) This angle is awkward on your wrist. Everyone is more comfortable with a straight shot than an angled shot, so you might not get the smooth, pure shot you expect when having to hit at an angle. 2) Your accuracy is compromised significantly. It’s easy to know if you’re straight back and forward, but when you start getting into more extreme angles, it’s hard to know if you’re making a straight line with your shot! And as you know, the more your angle differs from a straight 180, the more distance you’re going to lose. 3) Cross winds naturally cut off distance anyway. So, just the fact that you’re having to play this type of shot, where you are shooting into the wind, will cut distance. You’re more likely to retain distance by letting the wind carry the ball in the direction you hit, but of course this isn’t always practical. So, in summary, you might want to put a little extra power into these types of shots! That should help you overcome factors which might otherwise unexpectedly take distance off your approach. Heavy cross-wind — pull-back or thumbs? I got the idea for this post from a player named Kyle in Colorado, who was inquiring about general tips for using thumbs vs. pull back for shots to counteract a side wind. He saw how Sobe and players in these YouTube videos can seemingly control the spin on the shot once it hits the green, and he wants to learn more! Well Kyle — here you go! So far, so good. Since the ball is going to be rolling with the wind once it hits the green, the above situations present you with an opportunity to let the wind do the work by landing the ball “above” the hole and watching the wind carry it on towards the pin. Similarly, if the wind and the slope are in opposite directions, you can thumb the shot into the wind, let the wind blow it back above the hole, and then let the slope carry it back towards the pin. 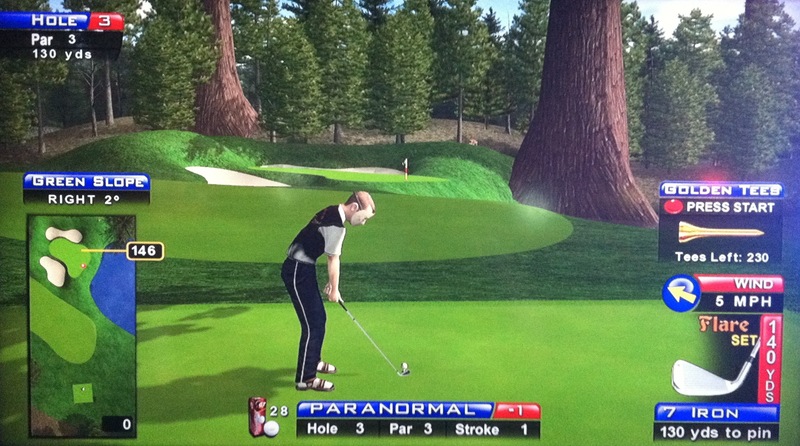 Now, let’s talk about situations where you need to pull back and shape a shot into the green. The most severe case is when the pin is on the right of the green, but the wind and slope are to the left. Using thumbs on this shot almost always leads to disaster — either you miss the green and end up in the rough on the right because you played too much wind, or you land on the green but the slope and wind direction carry your ball right off the bottom of the green. Both leave you with a chip and cost you a stroke! At best, you’ll have a long, very difficult putt, and that’s not good enough. The advantages of a cut shot with backspin in this situation are immense. Not only are you neutralizing the wind, but backspin can help the ball roll back UP the slope as well! The direction of backspin is something that takes a while for newer players to figure out, but it’s key in this situation. In the above example, let’s say you’re hitting a 3-iron. Pull back a little bit to the left, shoot forward a little to the left, and use backspin. The shot will cut back into the wind and should still be traveling to the right once it hits the green. Since it’s traveling to the right, backspin will help the ball continue to the right, UP the slope, before the speed slows and the ball settles. Now you should have a nice short putt instead! With the above example, you almost always want to club up from the default selection. You’ll probably want to have your distance estimate about 20 yards past the pin. The combination of the cross-wind, the hook put on the shot, and the backspin applied will leave you pin-high! Also worth noting again is the loft of the different irons. Wind affects a 9-iron a LOT more than a 3-iron, so you’ll have to cut the shot probably twice as much. With enough practice, you’ll be able to apply this shot more and more to your game instead of relying on your thumbs and hoping you can make a long putt! Now that you’re off the tee, let’s take a look at your strategy when determining your approach shot into the green. As with all shots (except putts) in Golden Tee, we’ll have to consider distance, wind, green slope, and elevation to determine the best angle and shot type towards the flag! First I size up the distance. 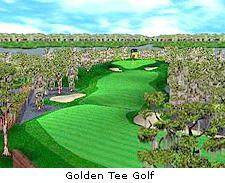 Take a look at the club that Golden Tee recommends by default. I usually change clubs from what the game recommends based on the wind. If there’s no wind, you can usually pick the club whose estimated distance will land you closest to the pin. For head and tail winds, adjust your club length as necessary (see “Playing the Wind”). Next determine if you want backspin or roll on the ball (see “Backspin/Roll” for approach shots). Notice whether you’re hitting into an elevated green or one well below your feet, because you may have to add/subtract a club based on the elevation (probably adjust by 1 club for every 10 yards difference in elevation). An important tip here is that the big woods or low irons sometimes don’t have enough loft to carry an elevated green! Try to pick a club that will carry high enough to reach the front of that elevated green. Your 1-iron or 3-wood might have the distance just fine, but it may never get high enough to reach the plateau. Another big factor can be the slope of the green. Visualize how the wind will affect the ball in the air, and how the slope of the green will affect the ball once it gets there. Try to play the wind so that once the ball gets to the green, it rolls along with the slope towards the flag. For example, if there’s a strong wind blowing to the right, but the green slopes hard left, I’ll shoot the ball out left of the flag and let the wind take it right of the flag. 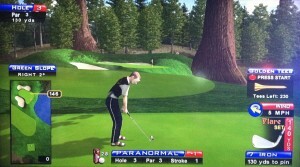 Then, when the ball hits the green on the right side, the slope will bring the ball back left towards the hole. Degree of slope is important to notice. If there’s not much slope, you can play a safer shot to the middle of the green, because your putt will still be fairly easy. If there’s a ton of slope, it’s important to get the ball as close to the pin as you can, because it’s very easy to miss long putts with a lot of slope! One situation in Golden Tee that calls for special attention is a shot where you have wind and side slope in the same direction. These are very difficult shots, especially if one or both are severe. If you simply shoot the trackball off against the direction of the wind, the wind will carry the ball back straight, and then the slope will continue to carry the ball in that direction, often times leaving you off the green. The best option, which is also difficult and requires practice, is to shoot an A2 or C2 shot, where the ball fights the wind so that it ends up on the top side of the green slope. In extreme cases, you may even need an A1 or C3 shot to fight the wind at a steeper angle. In addition, backspin won’t help your shot very much if the wind and slope are really pushing the ball sideways (the backspin will control the distance a bit, but the ball will continue on sideways as it spins backwards). Finally, based on all these factors, determine your shot type (see “Using the Track Ball”). On most of my iron approach shots, I don’t pull back the trackball – I just shoot the trackball forward with the speed and direction where I want the ball to go. But, depending on the wind and slope as mentioned above, you may need a two-step directional shot.